Entries tagged with “Chocolate Block”. Franschhoek pulls out all the corks for top German winemaker Bernhard Huber! About two weeks ago German wine writer Mario Scheuermann put out an appeal to his local connections, requesting that top Pinot Noir winemaker in Germany, Bernhard Huber of Weingut Huber in Breisgau in Baden, be looked after over his two week holiday in the Winelands. We offered to show off Franschhoek, and Bernhard and his wife Barbara were blown away by the quality of the wines in Franschhoek, and the generosity and friendliness extended to them. The flagship wine of Weingut Huber, in a region that has a 700 year history of growing Pinot Noir, is their Pinot Noir, of which only 2500 bottles are produced, and sell at €120 each. We started our journey at our Whale Cottage Franschhoek with a glass of sparkling wine, explaining some background to the village and the influence left by the French Huguenots, in naming their farms after the towns and districts they had come from in France, and planting the first vines in the valley. 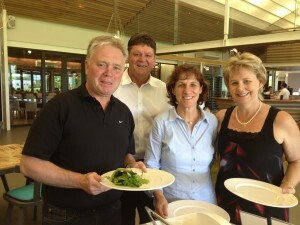 Restaurant recommendations were provided, should the Hubers have time to come back for another visit to Franschhoek. We talked through the Platter guide, which Bernhard knew, but he had not seen the 2013 edition, so we gave him our copy as a present, to accompany him on the remainder of his holiday. We described how Franschhoek’s reputation as a wine-producing region has grown, having been mocked until a few years ago for having such poor terroir that farmers had to buy in grapes to make excellent wines, to now having a Platter Winery of the Year in the valley two years running! We visited Boekenhoutskloof first, the Platter Winery of the Year 2012, and having collected the most 5-star wines of all the Franschhoek wine estates over the history of the Platter guide. The wine farm is one of the oldest in Franschhoek, having been awarded in 1776. Innocent Mpahleni was our host, and led a winetasting for the Hubers, pulling out a number of wines, including Boekenhoutskloof wines, which are rarely offered in a tasting. Innocent did a Cape Wine Academy course while he worked at Caroline’s, and has been at Boekenhoutskloof for five years already, he shared proudly. Boekenhoutskloof produces a total of 4 million bottles per year, of which 4% are made from grapes grown in their own 22 ha vineyard in Franschhoek. The wine estate was bought in 1992 by six directors from the marketing industry, and its winemaker Marc Kent was added as the seventh director, explaining the seven chairs on the label. Between 1994 – 1997 the fruit trees were removed from the farm, and vines were planted, pears, apples, oranges, limes, and stock farming having been practised before. The Wolftrap is the entry level wine (with a range consisting of Viognier, Chenin Blanc, and Grenache Blanc blend; Rosé; and a Syrah, Mourvèdre and Viognier blend), and is named after the jackals, lynx, leopards, and wolves believed to have been responsible for the loss of cattle on the farm, necessitating a trap. The farm is home to porcupines, and the farm tagged some of these and one can track their movement on their website. Porcupine Ridge is the mid-range wine range of Sauvignon Blanc, Viognier and Grenache Blanc blend, Merlot, Cabernet Sauvignon, Syrah, and Syrah/Viognier blend. The Chocolate Block is a blend made of Syrah, Grenache, Cinsaut, Cabernet Sauvignon, and Viognier grapes coming from different vineyards. Wolftrap and Porcupine Ridge are made at the Helderberg Winery, which belongs to Boekenhoutskloof too. The Chocolate Block and Boekenhoutskloof wines are made on the Franschhoek farm. They have recently started making the Porseleinberg Shiraz, which is exported to Sweden, and has a label made to resemble porcelain, receiving acclaim at CapeWine 2012 last September. We found some bottles of a new brand Le Cap Maritime, made from grapes from the Hemel en Aarde valley, at Lizette’s KItchen in Hermanus, which is an airline brand too. In 1996 the first 6000 bottles of Boekenhoutskloof were produced, from Cabernet Sauvignon grapes brought in from Eikehof in Franschhoek, and from Syrah grapes bought from Schalk Burger Snr’s Welbedacht in Wellington. 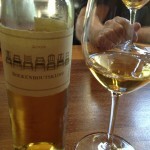 In 1997 the first Semillon was produced, the grapes coming from bushvines planted in 1899 at Eikehof. Two years ago Marc uprooted most of his vines, and planted new ones, the Cabernet Sauvignon, Semillon, Merlot, and Viognier being planted in the lower sections of the farm, and more planting to be done of Cabernet Sauvignon, Semillon, Cabernet Franc, Syrah, Grenache, and Viognier higher up on the farm. The grapes are grown organically, but not marketed as such due to the mix with grapes from other wine estates. We tasted the Porcupine Ridge Sauvignon Blanc, and Innocent described it as ‘one of the best selling Sauvignon Blancs in the country‘, and as a ‘poolside drink’, drunk young. The grapes come from Robertson, Citrusdal, Malmesbury, and Franschhoek. One million bottles are made in the Porcupine Ridge range. They made a Viognier Grenache blend four years ago for the first time, sourcing the Viognier from Malmesbury and the Grenache from Citrusdal, and being oaked for 13 months. Next up was The Wolftrap, a blend of 46% Viognier from Malmesbury, 28% Chenin Blanc from Stellenbosch, and 26% Grenache from Citrusdal, 600 litres of each being matured in their 24 cement egg tanks, as well as in French oak. Chocolate Block was first produced in 2002, a mere 12 barrels, and its current production has grown to 1432 barrels, or 400000 bottles in 2011. Grapes are hand picked, and they use interns, mainly from overseas, for the picking. Innocent said it is the ‘best selling wine in the country’ in terms of the speed at which it sells out, five months after production. Innocent told us that the Boekenhoutskloof annual production of 6000 bottles is sold out in advance, and initially he received no stock for the tasting room. That has changed, and he has at least one bottle in the range to offer for tasting every day. Every year one can order one or more of the 2000 mixed Boekenhoutskloof cases of 3 Semillon, 3 Cabernet Sauvignon, 3 Syrah, and one The Journeyman (a Cabernet Franc/Cabernet Sauvignon blend), at R4000. The bulk of the Boekenhoutskloof wine production goes to Caroline’s, Vaughn Johnson’s Wine Shop, La Cotte Wine Sales, and the directors of Boekenhoutskloof. All labelling is hand applied, and the best quality cork and bottles are used. The Syrah and Cabernet Sauvignon cost R380 each, and 1100 and 1500 cases are made annually, respectively. The Syrah grapes are hand picked over four days, and the wine spends 27 months in Barrique barrels, and egg white is added. 2400 bottles of Noble Late Harvest are produced, spending 30 months in new oak. Innocent shared that a Pinot Noir is planned. 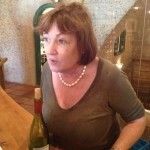 We had time for a quick stop at Haute Cabriere, and Hildegard von Arnim impressed in juggling a tasting in French with French winelovers, whilst paying attention to the Hubers in German, sharing that her husband Achim had studied winemaking at Geisenheim, and had pioneered growing Pinot Noir locally. 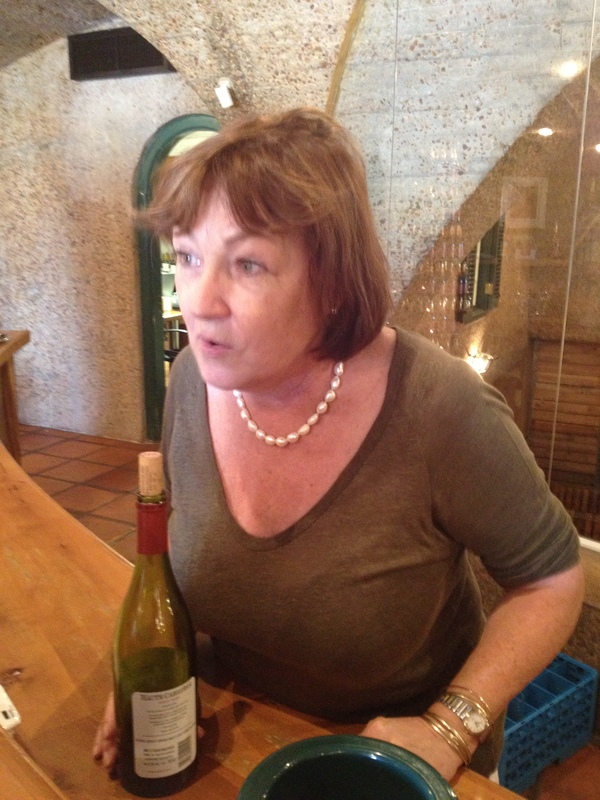 Over a glass of Pinot Noir 2009 (R160 per bottle), she animatedly told the story of how Achim had started a revolution in vinegrowing in our country. Together with a number of winemaking colleagues, including Hungarian Count Desiderius Poncrácz, they worked around a government quarantine of 9 – 12 years of imported grape varieties, to prevent importing viruses. They decided to smuggle in some Pinot Noir on a truck via the then Rhodesia, and were eventually reported to the authorities by a ‘colleague’. Before they got to court, Pongracz died in a car crash, leaving Achim and the other farmers to face the judge. He was a ‘good judge‘, Hildegard said, finding for the wine farmers, and instead of having them locked up, he had the quarantine law changed! We were invited for lunch by Hannelie and Hein Koegelenberg at their new The Rotisserie at Leopard’s Leap (photograph above), which has a salad bar made from vegetables and herbs picked fresh out of their garden, to which one can add a wrap, a piece of chicken, and/or pork. Chef Pieter de Jager sent a new creation to the table, beef topside rolled with a feta and pesto filling, which met with approval. 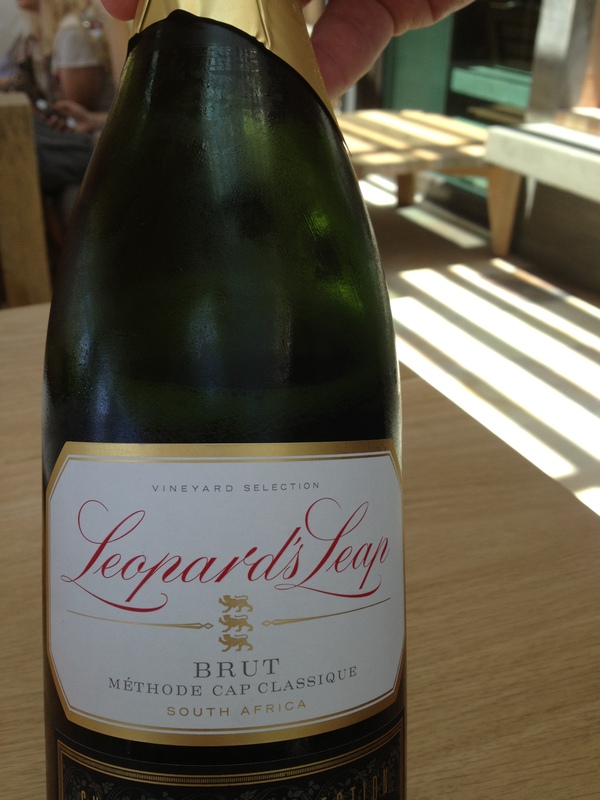 We tasted a Leopard’s Leap unoaked Chardonnay, of which 120000 bottles are made annually, by winemaker Eugene van Zyl, with grapes from Robertson, spending three months on the lees, and costing R42. 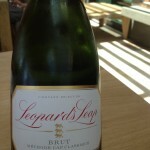 Hein explained that Leopard’s Leap was a second label for left-over Rupert wine estate grapes, but since 2005 it is a stand alone brand. They produce 4,2 million bottles in total, and export to 40 countries. L’Huguenot is a brand which was created for their alliance with Perfect China, and 3 million bottles are exported to that country, representing 50% of our country’s exports to Asia. Having created a tasting room for the Leopard’s Leap brand just over a year ago, Hein feels that he needs one for L’Huguenot too, for Asian visitors, 600 – 1000 expected annually via an incentive program. Hein shared that the market in Europe is difficult currently, with consumers buying down. They are selling La Motte at €9.99 and Leopard’s Leap at €4.99. The increasing excise duty, in the UK in particular, influences wine sales, representing R5,70 per bottle in that country. The Leopard’s Leap Merlot is made from grapes coming from Agter Paarl and the Swartland, 60% being barrel fermented in French oak, and 80000 bottles are produced annually. Organic farming at La Motte commenced ten years ago, which has brought balance to their vines, the acid is stable, the pH is low, they use less sulphur, and their yield is lower, reducing their carbon footprint. 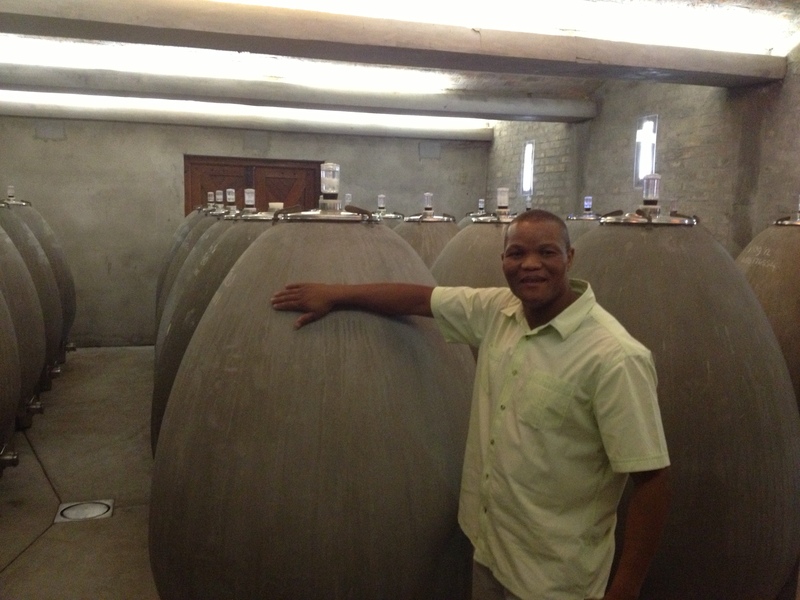 Hein enthused about the 2013 vintage, given the winter rains, and the long late start to summer. The Koegelenbergs and Hubers will see each other at ProWein in Düsseldorf in March, agreeing that it is the best wine show in the world. We ended off the lunch with a tasting of the recently launched Leopard’s Leap MCC from the new Culinaria Collection, a 55% Chardonnay and 45% Pinot Noir blend. Hein shared that Chile and Argentinia are fierce competition to South African wines internationally, given that their price points are lower. Given the small harvests in Europe, South Africa will be pushed to export more of its bulk wine this year. Bernhard said that 85% of wines drunk by Germans is from Germany, the balance being from Italy and France. Bernhard was astounded at the volumes Hein was sharing about Leopard’s Leap, compared to his own small production runs. The generosity of time astounded the Hubers, as Hein had returned to the office from holiday that morning, and was flying out to London that evening, generously spending time with us for the lunch, and then personally taking us around La Motte and doing a tasting of their wines. The wine farm was awarded to a French Huguenot in 1695, and the original wine cellar and manor house were built around 1750. La Motte is 169ha in size, of which about half is planted to vine. In relaunching La Motte, they built a new winetasting centre, a museum, and a farm shop, as well as the Pierneef à La Motte restaurant, starting with 3000 visitors a month, which has grown to 8000 – 10000 per month now. Hein shared the link to late artist JH Pierneef, whose family collection hangs in the museum, and after whom the Pierneef à La Motte restaurant was named, and their new vegetable and herb garden, their policy being to source organic and free range meat too. 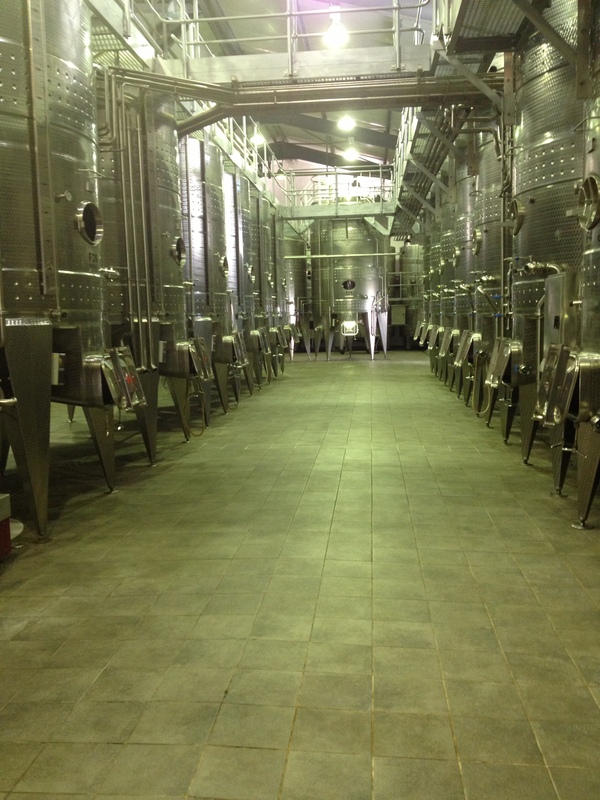 We were shown the separated red and white wine facilities, 600000 cases of red wine being produced. They double sort their grapes, and have a mobile bottling plant which can do 3600 bottles per hour. The barrels are kept at low temperature and high humidity. The Sauvignon Blanc 2012 production is just over half a million bottles per year and is the focus of the white wine winery, and 30 – 40% of the fruit comes from La Motte, the balance coming from Nieuwoudtville, Lutzville, Elands Bay, Elgin, Darling, Bot River, and Elim. We then tasted the Pierneef Collection Sauvignon Blanc 2012, an organic wine, made from Bot River grapes. Its production of 36000 bottles sells out quickly on allocation. The Chardonnay is made from Franschhoek grapes, and 18000 bottles are produced. The Millenium 2010 is a Bordeaux Blend to which they have added Shiraz, 180000 bottles being produced. The Cabernet Sauvignon 2010 is made from grapes coming from the Swartland, Bot River, and Darling. 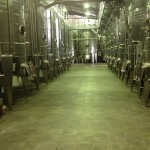 The Shiraz 2009 is an excellent vintage, with just over 100000 bottles produced. Grapes come from La Motte, Bot River, Agter Paarl, and Elim, and the wine reflects the La Motte style of red berry and black berry, with white peppery spices. The La Motte Pierneef Shiraz Viognier 2009 is more feminine in character, Hein said, and its production of 36000 bottles is therefore made in a lighter and lower alcohol style. Grapes come from Bot River and La Motte. Only 12000 bottles of the La Motte Pierneef Shiraz Grenache 2008 were produced, the Grenache coming from 30 year old bush vines in Darling, and is more masculine in character. The Hannelie R is the pinnacle of their range, being ‘the best wine which we can make’, Hein said. It is released five years after it is made, and only when the fruit is excellent. So far the wine has been made in 2005, 2007, and in 2009. Only 3000 bottles are produced, the wine spending 48 months on wood and a year in the bottle. Each production sees a change in the blend composition. Michael Fridjhon and Carrie Adams (of retailer Norman Goodfellows) sit on a panel to help decide which fruit should go into the blend, Hein shared. It is sold at $100 per bottle. Hein presented the Hubers with a copy, signed by Chef Chris Erasmus, of their ‘Cape Winelands Cuisine’ cookbook. 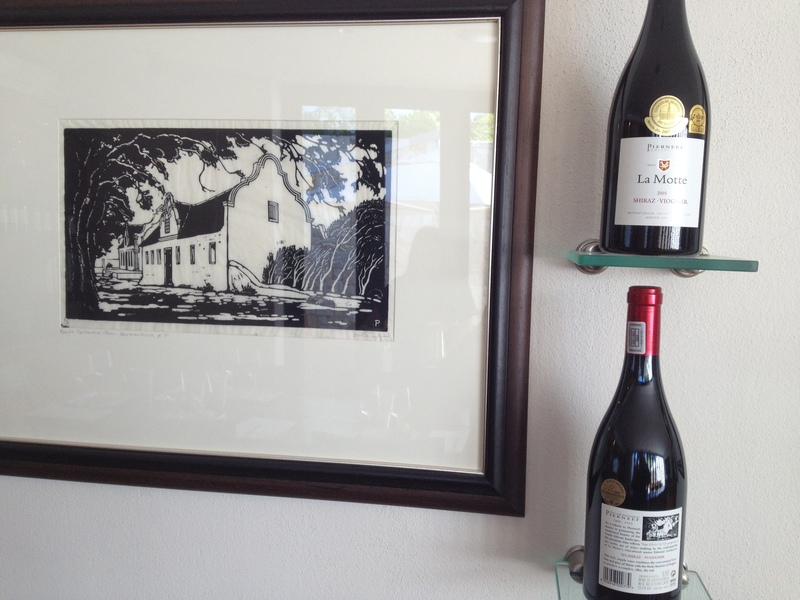 We made a quick stop at Grande Provence, showing the Hubers the impressive tasting room, restaurant and art gallery. We were delighted to bump into GM Karl Lambour, and to discover that Grande Provence makes a Pinot Noir too, which he invited the Hubers to taste. Our final stop was at Platter Winery of the Year 2013 Chamonix, an interesting experience. Winemaker Gottfried Mocke was still on leave, but maverick owner Chris Hellinger welcomed us in his recently opened safari lodge perched high up the Mont Rochelle mountain overlooking Franschhoek, being 540 m above sea level. The lodge was filled with stuffed animals which Mr Hellinger has hunted around the world. We were invited to taste the noble 5-star Pinot Noir Reserve 2011 (costing R240 per bottle), the only Pinot Noir to achieve this quality in Franschhoek. Mr Hellinger has been in South Africa for 44 years already, and bought Chamonix in 1991, a farm of 265ha, of which 55ha has been planted to vines, and also contains a game nature reserve. Mr Hellinger explained that their wines have become consistently better, and their higher vines get the sun later in the morning, and the temperature is cooler in the afternoon. Their use of compost is minimal. The farm had fruit trees, which they removed to plant vines. They only make wines from their own grapes. He has invested R40 million in his estate. Mr Hellinger said that they will work on reducing their wine range, but there is another ‘more exclusive wine to be created’‘. He praised his winemaker, who has been with him for more than ten years, and he gives him a free hand in what to grow and to produce. They use cement egg fermentation tanks too. We received feedback subsequently that the Hubers thoroughly enjoyed their day in Franschhoek, and they graciously handed over a bottle of their noble Pinot Noir to each wine estate that hosted them. We thank Boekenhoutskloof, Haute Cabriere, Leopard’s Leap, La Motte, Grande Provence, and Chamonix for their time and information shared with this important winemaking couple from Germany, and for growing my own knowledge about the Franschhoek Wine Valley too. Franschhoek Uncorked toasts long-awaited Spring! After one of the wettest winters in a long time, Franschhoek is ready to welcome Spring with its ‘Franschhoek Uncorked‘ festival on 1 and 2 September, and has laid on a wine and food tasting feast in its honour. Nineteen wine estates are inviting wine lovers to meet their winemakers and taste their wines on their estates, at a cost of R100 for the weekend pass, covering both days. * Anthonij Rupert Wines: Taste Protea and Terra del Capo wines for free, or attend a ‘bespoke‘ tasting of Anthonij Rupert wines at R50. Half price entrance to Motor Museum, at R30. * Franschhoek Cellar: jazz band, free tasting of wines, cheeses, chocolates, and olives. Cheese lunch at R100 for two. * Grande Provence: free tasting; buy 11 bottles of Cabernet Sauvignon and/or Shiraz and get one free; taste the 2012 Sauvignon Blanc and Viognier, and Chardonnay 2011; tapas; Marimba band; art exhibition ‘Walk this earth alone‘; five-course degustation menu on 1 September paired with Grande Provence and New Zealand Chardonnay and Pinot Noir wines, at R495. * La Bri: offers cheese platters, olives, homemade bread and chocolates to buy, five year vertical wine tasting R100, chocolate and wine pairing R50. * La Vigne: wine tasting, art exhibition by Lötter de Jager, Pasta Fresca, outdoor chess. * Noble Hill: taste first Rosé, gourmet taco, live music. * Solms-Delta: Kaapse music, Kaapse food, Kaapse wines! * Vrede & Lust: decor for sale, baguettes and mussels, Lindt chocolate. Franschhoek pops the corks at ‘Franschhoek Uncorked’! Comments Off on Franschhoek pops the corks at ‘Franschhoek Uncorked’! This weekend Franschhoek will celebrate its fourth ‘Franschhoek Uncorked’ weekend, and all indications are that the weather will be reasonably kind to the event. Eighteen Franschhoek wine estates invite visitors to Franschhoek to visit them, not only to taste their wines, but also to enjoy the unique food and entertainment at each estate. * Solms-Delta: Celebration of ‘van die Kaap’, with Cape music, food, wine and traditional music. Pairing of ‘Cape fusion cuisine’ with Cape wines. Tel (021) 874-3937. * Graham Beck Wines: Fresh oysters, fresh basked breads, cheeses, charcuterie, from Oude Bank Bakkerij to complement tasting of wines and Mèthode Cap Classique. Master classes by winemakers Pieter Ferreira and Erika Obermeyer, at 11h00 on Saturday and Sunday, at R75 per person. Tel (021) 874-1258. * La Bri: Art by Hamlin, sale of plants, bulbs and seeds, fresh baked breads, cheeses, soups, picnics, three course dinner with winemaker on Saturday evening at R350 per person. Tel (021) 876-2593. * Holden Manz: Live band, cocktails, fun activities, Official Uncorked After Party, Saturday, from 5 pm. Tel (021) 876-2729. 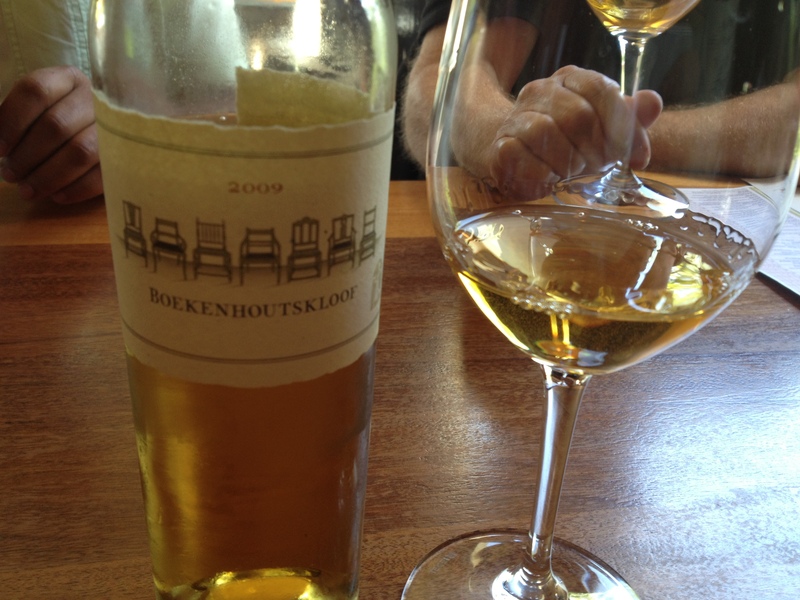 * Boekenhoutskloof: Release of Chocolate Block 2010. Barbeque Extravaganza by Reuben’s. Kitchen Jamming Blues Band. Tel (021) 876-3320. Franschhoek Uncorked, 3 – 4 September. R100 allows multiple entries to the wine estates over the weekend. Book via www.webtickets.co.za Franschhoek Wine Valley supports responsible drinking, and has a number of shuttle services listed on its website www.franschhoek.org.za. A number of wine specials are available this weekend, and are listed on the Franschhoek Wine Valley website too. Franschhoek has a wealth of wine and wine shops! In the last month two new wine shops (WINES and the House of Wines) have opened on the main road in Franschhoek, a village that already has 45 wine estates open to the public, from which one can buy wines, in addition to a well-stocked Pick ‘n Pay Liquor department, and the long-established La Cotte Inn Wine Sales. To get a feel for wine sales in Franschhoek via the four wine outlets, I went to visit each of them, and did a comparative price survey based on a randomly selected list of mainly Franschhoek wines, and asked each of the shops what makes them unique regarding the wines that they stock. Ludwig Maske has owned this wine shop at the entrance to Franschhoek for about fifteen years, the building previously housing a grocery store/general dealer, as well as the restaurant Lanternhof, which belonged to his father. 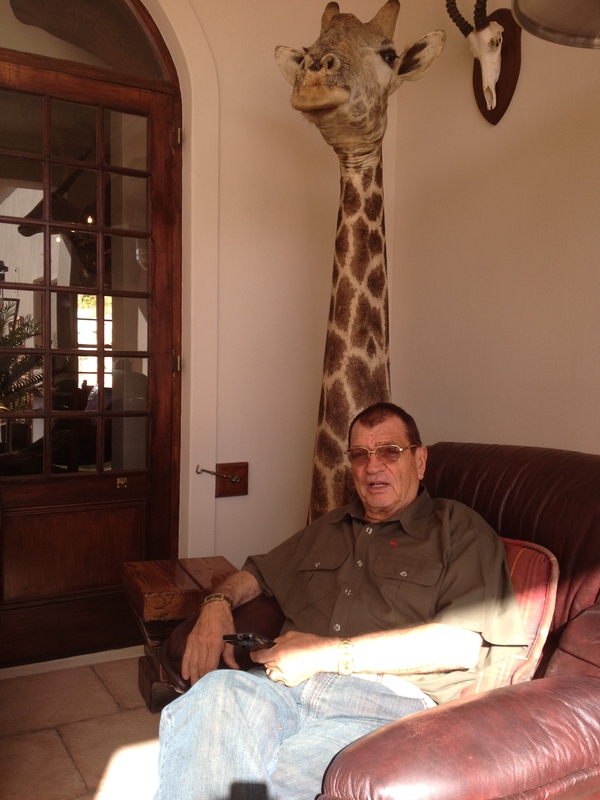 Ludwig started his career by running the liquor sales section of the old La Cotte Inn, where the Protea Hotel is located now, in his father’s hotel. Maske’s grandfather owned the Swiss Farm Excelsior (now the Le Franschhoek Hotel), which was a well-known for a Sunday afternoon treat of tea/coffee and scones. The Maskes have earned their stripes in Franschhoek, and La Cotte Inn Wine Sales is synonymous with Franschhoek wines. Ludwig told me that the main part of his business is to supply restaurants with their wine requirements, receiving stock from the wine estates, which is stored, and delivered to the restaurants on demand. This service is of benefit to the restaurants and the wine estates, as each party works with only one monthly invoice. Wine sales from the rather dark and characterful shop on the main road are incidental, and would not have carried the business alone, Ludwig said, almost feeling sorry for the new wine shops. 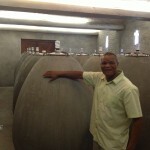 Ludwig said that he represents 48 of the 50 Franschhoek wine estates. 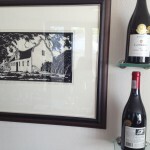 Scarce supplies of Boekenhoutskloof Shiraz or Cabernet Sauvignon may be easier to buy at La Cotte Inn Wine Sales than from the wine farm itself. The shop sells mainly Franschhoek wines too, but also imported wines such as Mosel Riesling, and wines from France and Spain. The largest number of imported wines in Franschhoek are sold by La Cotte Inn Wine Sales. In addition to wines, they sell a wonderful selection of up to 100 imported French cheeses, Cuban cigars, Riedel stemware, and the popular Le Nez du Vin wine aroma testing kit. Ludwig said that he sells about 30 non-Franschhoek wines, in addition to the 48 Franschhoek wine estates that he represents. He helps wine farms with winelist compilation, and also with pricing, if required. He urges restaurants to keep wine prices reasonable, and told me that he recently persuaded Le Quartier Français to reduce its wine prices. In the shop, Porcupine Ridge is the best seller, priced at R33 for Sauvignon Blanc and at R47 for their reds. Graham Beck and La Motte wines are in second and third place on sales, being strong and well-known Franschhoek brand names. Being a wholesaler, La Cotte Inn Wine Sales offers the best prices of all four Franschhoek wine shops, especially for Franschhoek wines. Ludwig was critical of Pick ‘n Pay nationally, saying that they offer customers one-shop convenience, but that they are ‘killing the small guys’, having recently bought five Aroma stores and turning them into Pick ‘n Pay Liquor outlets. It was interesting to talk to Sigi Juling, who described himself as a Namibian and not a German, but he and his fianceé Bettina are both German-speaking. I was not aware that Sigi had owned Bijoux Square, also on the main road, and here Sigi had owned a House of Wines shop from 2002 to 2007. He sold the building, and worked in Namibia and went to Europe, returning to open his wine shop in a new location on the main road, opposite the Post Office. Sigi is knowledgeable about wines, and their pairing with foods, having completed a Diploma from the Cape Wine Academy, having worked as a Sommelier at Grande Roche, having completed a hotel qualification in Germany, having worked at the Radisson Hotel in Granger Bay, and having been the Food and Beverage Manager of La Couronne Hotel before it was renamed Mont Rochelle. Sigi stocks wines from 170 wine estates, which are ‘perfectly matured’ according to his business card, and he is looking to increase this number. He told me immediately that he stocks mainly non-Franschhoek wines, as his Franschhoek customers, many loyal from his previous wine shop, are bored with the Franschhoek wines, and want to try something new. He also stocks a number of wine-related items in the shop, including an interesting game called Wine-opoly, bottle stoppers, wine books, DVD’s, and more. Sigi described his shop as proudly-South African, not selling imported wines. The wines he stocks are those that his clients like to buy, and those that he himself likes. He does specialised wine tastings for his customers. His top three sellers are Springfield Sauvignon Blanc, in top position by far (R84,85), followed by Haute Cabriere Pinot Noir Chardonnay (R72,95), and Delaire Shiraz (R84,85). Sigi is looking to add an olive oil and vinegar section, and both products will be available on tap, which can be bottled in one’s own containers, or in a selection of containers that they will sell. House of Wines, 28 Huguenot Road, Franschhoek. Tel (021) 876-4120. www.how.co.za Tuesday – Sunday 10h00 – 18h00. The newest and most modern Franschhoek wine shop is in the new Franschhoek Centre, which also houses the new Pick ‘n Pay and Clicks, and is next door to Café Benedict. It is co-owned by Elsa Post, an enterprising Franschhoeker, who also owns the Franschhoek Postnet franchise, and Robert Maingard, the owner of the centre, and of a number of Franschhoek businesses, including Dieu Donné, Café Benedict, the Le Franschhoek Hotel, and the newly opened Le Coq. What makes this wine shop different to the others is that the stock of wine is kept on consignment, meaning that the wine estates are paid when their wine sells. Elsa told me that she bought the Platter’s database, and wrote to the wine farms in it, inviting them to have their wines sold on consignment. She received a good response, and 83 wine estates’ brands are sold in the shop. Interestingly, only six Franschhoek wine estates (Dieu Donné, Grande Provence, La Verdure, Chanteclair, La Manoir de Brendel, and Topiary) supply the shop, the Franschhoek Vignerons officially not supporting wine sales on consignment, which smacks of Franschhoek politics. Each wine estate that has signed up with WINES at no charge has good shelf positioning, and is featured on touchscreen TV monitors on the shelves, with tasting notes provided about each wine. The wine estates are also invited to conduct tastings outside the shop, which attracts attention to the shop, and yesterday I saw a number of persons coming to taste the wines of Arumdale from Elgin, the first time I had heard of the brand. The top selling wine by far is the mouthful of a brand Hermanuspietersfontein, with Diners Club Winemaker of the Year Bartho Eksteen, and it is his Kleinboet (R104) and No 7 (R91) that sell particularly well, followed by wines from Under Oaks in Paarl (R54 for Sauvignon Blanc and R82 for Shiraz), and Muratie Shiraz (R123). In addition to the wines sold, they sell wine cooling bags, the book ‘South African Wines’, crystal glassware, and decanters. Delivery locally is free, and international shipping of wines can be done via Elsa’s Postnet service. Special protective packaging for the shipping of wine bottles is sold by WINES. One may buy a bottle from WINES, and then drink it at Café Benedict, without paying for corkage. WINES,Centre de Franschhoek,23 Huguenot Road, Franschhoek. Tel (021) 876-3185. No website. Monday – Saturday (they have applied for a liquor licence, allowing sales on Sundays) 9h00 – 18h00 (the licence allows them to remain open until 20h00, and they will do so if they have clients wishing to buy wine). The local supermarket has a large section allocated to its Liquor store, with about 20 Franschhoek and about 40 non-Franschhoek wines stocked, in addition to beer and spirits, cheap glasses, ice and cigarettes. The wines are displayed by variety, and here and there a special can be found on the shelves. The top three selling wines this month are Porcupine Ridge (R32,99), Graham Beck Brut Rosé (R99,95), and Haute Cabriere Pinot Noir Chardonnay (R79,99). The Haute Cabriere appears on two of the four best seller lists in the Franschhoek wine shops. Pick ‘n Pay appears to be the most expensive outlet at which to buy wines in Franschhoek, and it does not have dedicated staff who can inform and advise their customers about the wines that they stock. * Note: special sale price, normal price R88,99. La Cotte Inn Wine Sales definitely is the shop to buy a Franschhoek wine at, both in terms of having a good likelihood of the wine being in stock, and of it being cheaper to buy there than elsewhere in Franschhoek. For non-Franschhoek wines, WINES and House of Wines would be the best sources, depending on the brand required, the latter offering a larger selection of wine brands, and both being likely to be cheaper than Pick ‘n Pay. Restaurant Review: Le Coq good value Franschhoek family restaurant, dreadful ‘Dali’ decor! I have the highest regard for the entrepreneurial spirit of Robert Maingard, although he is not Franschhoek’s favourite semi-citizen. Mr Maingard has incredible faith in Franschhoek, judging by his investment in this village, including ownership of Dieu Donné, Le Franschhoek Hotel, Crepe et Cidre, numerous small shopping centers on the main road (one which includes a Clicks and the village’s second Pick ‘n Pay, which has had the residents up in arms), and now owner of Café Benedict and the newly opened Le Coq restaurant. I visited the restaurant three times over two days, to get a grip on this ‘schizophrenic’ restaurant, which is located in the new (as yet unnamed) centre which was built where the old Huguenot Hotel once stood. The French rooster is the symbol of all things Gallic, Wikipedia informs, and Mr Maingard’s Mauritian roots show in his choice of name for the restaurant in this French-faux village. The rooster that graces the entrance to the restaurant was found under a table in Mr Maingard’s home, Llewellyn Lambert told me. The restaurant is huge, with an industrial feel to the space, with visible airconditioning trunking. The restaurant is divided over two levels, each seating about 60 patrons, probably the largest restaurant in Franschhoek. The upstairs level has its own Grill menu, and focuses on steak. Here too is a coldroom, so that one can see the meat hung for use for grilling, and from which meat can be sold to customers to take home. Downstairs, the menu focus is on affordable light meals. With its French name, its interior design is a surprise, it is so bizarre! The downstairs section has a fireplace, which will be cosy in the cold Franschhoek winter, and above it hangs a Salvador Dali ‘replica’. Here is where things go dreadfully wrong with the decor, the designer being Carol Cornwall, of Cornwall Interiors in Durban, who has done all Mr Maingard’s Quarters Hotels, Dieu Donné and Crepe et Cidre. Dali was a Spanish abstract artist, now used in a French style Franschhoek family restaurant. There is another Dali ‘replica’ upstairs, a copy of the famous ‘The Persistence of Memory’ above its fireplace, the well-known pocketwatch one, hence all the clocks on the walls. Without the explanation by Lambert, I would not have made the connection. There are more ‘Dali’s’ to come, I was told! But worse still is the lounge sections that have been created in each of the two levels, for those patrons who have to wait for a table (it will take some time to get to this stage, given that Franschhoek is already seeing its first pre-winter casualties, with restaurants and other shops closing down). The furniture for these two sections looks like it comes straight out of Joshua Doore – a white ‘plastic’ couch upstairs, and ‘velour’ high back chairs in orange and blue downstairs! Going back for the third time, I understood the decor approach, being to pick up the blue and the burnt orange from the ‘Dali’s’ for the chairs, but it is the execution that I cannot understand, in that they make the restaurant feel common and kitsch. The rest of the decor, in terms of the tables and dining chairs (white leather downstairs and beige fabric upstairs) is absolutely fine. Lambert told me that Mr Maingardis an avid antique collector, and antique sewing machines have formed the bases for the upstairs granite-top tables. One can sit outside on the terrace upstairs, with a lovely view onto the Franschhoek mountains, but also onto the large parking area below. Parking is a benefit of the new development, given that Franschhoek lacks parking on its main road. Mr Maingard recently bought the Lecca il Gelato franchise for Franschhoek, and will be using one of his already vacated shops in the new center in which Le Coq is located for the new ice cream shop. It is so big, that he has decided to make the shop a play and activity centre for children while their parents eat at Le Coq – I could think of nothing better for a kid to play in an ice cream shop! I could not help but think that the large industrial-style two-tier restaurant reminded me of my own joke that the two Franschhoek Pick ‘n Pays have two target markets: one serves the ‘bodorp’, and the other the ‘onderdorp’, and so too the restaurant’s upstairs grill and downstairs Light Meal section is likely to see a similar divide! The managers are a collection of staff from Maingard properties. Lambert came from Quarters in Durban earlier this year, to open Café Benedict. Manager Nikki Leu comes from Durban too, where she did staff training for Mr Maingard’s businesses. I found it very hard to connect with her. Food & Beverage Manager Alan Smith comes from the Grill Room, opposition to Mr Maingard, previously owned by Matthew Gordon and the late Trevor Kirsten, who was also a Franschhoek property mogul, vying for the same high street properties. Chef Albert van der Loo comes from Dieu Donné. He said that running a kitchen for a 120 seater restaurant is no problem, especially as the orders are staggered over the evening, compared to the 240-seater Dieu Donné, where all guests wanted to order immediately after the sun has set, creating huge pressure on the kitchen. He has a massive downstairs kitchen for the light meals, and the steaks are prepared upstairs. Chef Albert is excited about the new challenge he has in running his own kitchen, and says he worked hard on creating the right balance of dishes for the Light Meal menu. He is bringing in a sushi chef from Japan, a relative of the sushi chef’s girlfriend from the ‘bodorp’ Pick ‘n Pay. His vision at Le Coq is to offer good quality affordable meals for Franschhoekers. The tables do not have table cloths, but material serviettes and St Tropez cutlery. A very light weight steak knife by Victorinox seemed too light to be effective, but did a good cutting job. There are no condiments. Only a little glass candle holder is on the table. No one offered pepper on any of my three visits. My first visit was for lunch on Saturday, in the downstairs section, and I had a most delicious pea and mint soup from the Cold menu selection (good value at R35, but when Etienne Bonthuys charges R30 for the thickest and creamiest Avocado soup with prawn, it is not!). I asked the waitress whether it comes with bread, but she said it did not. I returned on Saturday evening, on my way to Stellenbosch, and tried the Tempura prawn from the Hot menu selection. I asked specifically if it is de-shelled, and the waitress checked that it would be. The tempura batter is around the prawn tail as well, and I was talking so much that I bit into the tail which did have the shell over it, which spoilt the dish for me. I had a good Cuturra coffee, with a strong coffee flavour. If one sits downstairs, one may order from the Grill menu, but one may not order from the Light Meal menu if one is sitting upstairs, which seems odd and inflexible. Other Cold Meal options (R35 – R75) are smoked salmon salad, roast beef and blue cheese salad, Caprese salad and Bruschetta of Beef Tartare. Oysters cost R90 for six. The Hot Meal menu prices range from a most affordable R60 – R75, and include mussels, fish and chips, oxtail, beef burger, Cape Malay chicken curry and penne pasta carbonara. Gelatos, jellied sparkling wine, chocolate brownies and ‘American Dreams’ cost R30 – R40. The Grill menu has three starters: The Prawn cocktail was wonderful, with six juicy prawns, at R65, but I did suggest to Chef Albert that he take off the tails; beef carpaccio (R50), and a Chef’s salad at R55. There are seven grilled meat options, served with chips and onion rings, ranging from R75 for an Algerian spatchcock baby chicken to R105 each for a 500 gram T-bone steak, and 250 gram fillet. The weight of meat is not specified on the menu, but the waitress told me the weight when I asked her, unfortunately getting the weight of two items wrong, one of them being for the fillet I ordered. The fillet was good, served alone on a plate, and the sauce and mash came in two extra dishes. I had ordered the steak Medium Rare, but it tended to Medium, and Chef Albert (who commendably came to check after every course) explained that it has to do with the ageing of the meat, taking away some of the pink colouring of the meat. It was very tender, and Chef Albert told me that they source their meat from Tomi’s near Hermon, where they farm with Angus cows. Le Coq is the first Franschhoek client, and Chef Albert was very impressed with the marbling of their meat. Sauces cost R15, and one can choose Hollandaise, Bourbon mushroom, Classic red wine steakhouse, and green peppercorn sauces. Desserts here are simply one of four Gelato flavours, costing R35. The menus and winelist are beautifully presented, and Chef Albert worked with photographer Eddie Wilson to create covers for them using beautiful photographs, one taken from the restaurant. The winelist covers has a photograph of three Dieu Donné wines, but has a good selection of mainly Franschhoek wines. It has a description of the wine, but no information on regions or vintages is provided. The white wines range from R30/R100 for Overhex Balance and R30/R110 for Flagstone Noon Gun, to R 380 for Graham Beck Pheasant Run Sauvignon Blanc. Other wines by the glass are Dieu Donné Chardonnay (R35/R110), Protea Chenin Blanc (R30/R90) and Ashton Kelder Chardonnay (R35/R115). Red wines start at R 30/R110 for Ashton Kelder Satynrooi and R30/R110 for Avondrood Blue Whale, up to R 500 for Chamonix Pinot Noir Reserve. I was surprised to see Chocolate Block Shiraz blend charged at a pricey R390. Other red wines by the glass are Diemersfontein Pinotage (R50), Perdeberg Shiraz/Cabernet Sauvignon (R35/R130), and GlenwoodMerlot at R40/R165. Sparkling wines are not sold by the glass, which is a shame, and include Dieu Donné Blanc de Blanc Brut (R200), Graham Beck’s Brut Rosé (R240), Colmant (R280), and Moët “en” Chandon (R950). One can also order “Le Coq-tails” and “Le Moq-tails” at R35 – R45. To celebrate the opening of the restaurant on Friday, live music will be played in the lower section every weekend day and evening. I found the band from Wellington terribly loud, as did the chef, and they were asked to tone things down a little. Every month there will be new groups playing. Le Coq is a restaurant out of the usual Franschhoek mould, and one wonders if there are enough locals with families to support this large restaurant, currently being supporters of Kalfi’s, Col’Cacchio and Allora. It offers very good value for money, especially in the downstairs Light Meals section. Its staff service and training needs attention. Its French/Spanish decor conflict needs drastic help. It will survive the winter and any continuation of the downturn, as Mr Maingard is the owner of the building, so that his cost structure is different to that of any other restaurant. It needs a stronger leaderto run the restaurant. It lacks focus, trying to please too many tastes under one roof, and creates confusion with two-restaurants-within-one. It will be interesting to see if they receive the support from the anti-Clicks ‘bodorp’ Franschhoekers living in a village known for its nasty politics! POSTSCRIPT 21/5: I popped in for a cappuccino this afternoon, and immediately noticed the addition of a massive “Dali Atomicus” print by photographer Philippe Haselman, featuring Dali, three thrown cats, and a thrown bucket of water – what a weird composition! From a Google search I learnt that the photograph took 26 takes over five It looks very impressive behind the bar, and much nicer than the Dali painting copies hung in the restaurant. The Manager Alan has already left the restaurant, for a job elsewhere. Le Coq, 32 Huguenot Road, Franschhoek. Tel (021) 876-4224. No website yet. Tuesday – Sunday, lunch and dinner.